Universal Weather and Aviation, Inc. has been offering business aviation services for 50+ years, facilitating more than 3 million trip legs and providing consistency and quality service to operators traveling worldwide at 47 locations in 19 countries. You can count on us for more than award-winning ground support. We understand what schedule changes really mean, and that surprises waste time, excuses are worthless, and “no” is never an answer. 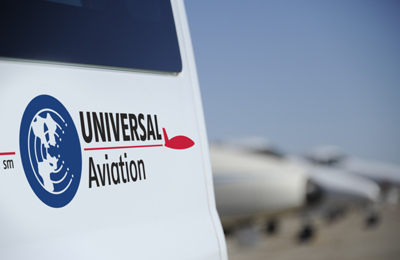 Today, our clients know that when they use Universal, they have access to the experience and expertise for which Universal is recognized throughout the business aviation industry. It is ultimately the Universal name and promise that clients rely on. Universal Aviation® Ground Support. A worldwide network of FBO and ground support locations specializing in regional/local expertise. UVair® Fuel Program. Competitive fuel rates, and the UVair fuel card, giving you worldwide acceptance, with no annual fee. Trip Support Services. Comprehensive solutions or customized individual services vital for safe, successful trips. Trip Tools. Innovative, do-it-yourself solutions, from online flight planning to aircraft data link. 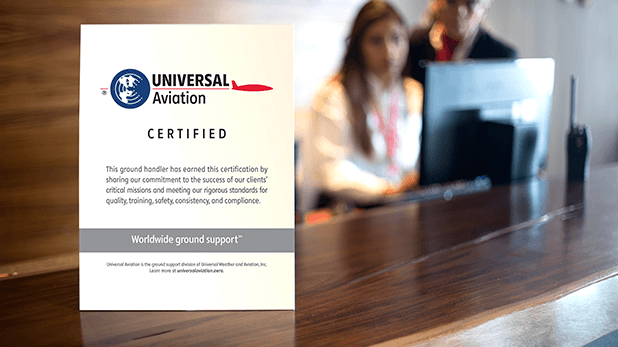 The Universal Aviation® Certified program is designed to recognize and distinguish independent ground handlers around the world that meet the stringent standards of Universal Aviation for quality, training, safety, consistency, and compliance. These are ground handling partners with which we’ve had long-standing relationships—as preferred ground handlers of our parent company, Universal Weather and Aviation, Inc. And certification is only offered to those handlers who have proven that they share our absolute commitment to the success of our clients’ missions. Operators can feel confident that when they chose a Universal Aviation Certified location, even in remote locales, they will receive the same level of service and commitment that they would at a Universal Aviation location. All members undergo the same training programs as Universal Aviation locations, must pass a rigorous audit, and must continually meet and exceed service standards. Operating ground handling businesses in over 20 countries worldwide, we know what it takes to differentiate from the competition, build loyalty with a global audience, and succeed in this continually-evolving industry. We do this by consistently helping our clients reduce stress and drive risk out of their operation and doing everything it takes to help make their missions a success. 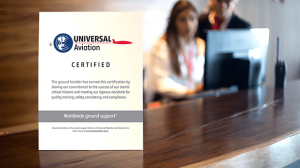 The Universal Aviation Certified Program is designed to continue building loyalty and trust among our clients globally, and reward our partners who share in our commitment to them. As a member you will have access to our customer service and ramp training programs in addition to other joint marketing initiatives. You’ll also benefit by being the primary handler on the field for receiving traffic from Universal Weather and Aviation, Inc. and its clients. Your location will display Universal Aviation Certified branding and signage, and will still maintain its own independent brand identity. What is critical to us is that we see both of our organizations grow and succeed by exceeding our clients’ expectations on the ground. Avoidance of delays is at the heart of every service we provide. Universal Aviation has the local knowledge and expertise to help reduce the inconveniences of international travel – such as obtaining local permits, processing passengers and crew through customs and immigration, and arranging other services through third-party suppliers. In addition, we adhere to strict operating and customer service standards that result in consistent, professional, and personalized service at every location we serve.